We had our January business meeting this past Tuesday (10 Jan). This marks almost one year exactly that Dayton Diode has been in our first space on Front St. If you've donated, paid dues, spamed our list, or just stopped in to hang out then give yourself a nice pat on the back. 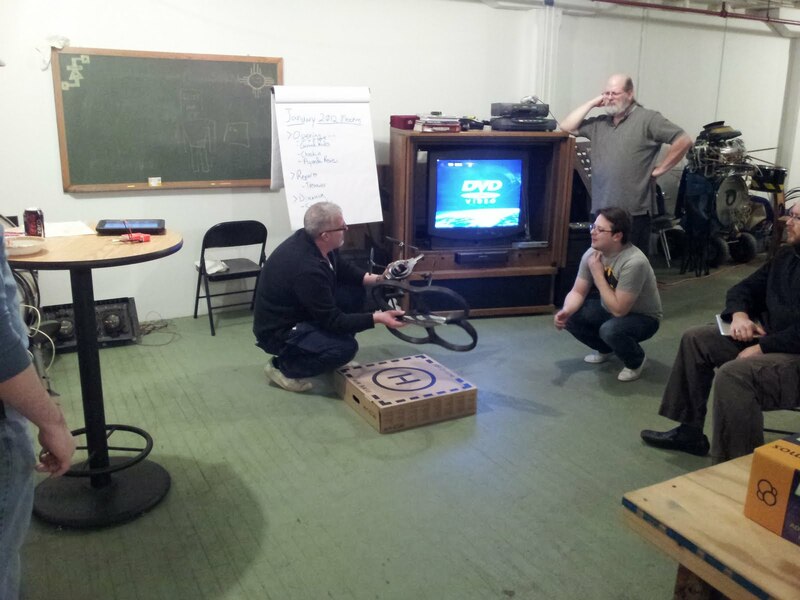 Yea for one year of hackerspace fun in Dayton, you made it happen!! We had a good discussion about several items of business, the most important of which is our emerging corporate membership and marketing sponsorship package. Check the wiki for detailed minutes taken by our ever reliable Minute Man. We are going to hold an Open House on 27 Jan 21 Jan, everyone is invited. 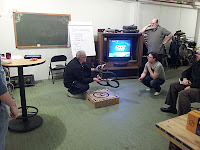 Keep an eye on the meetup group and the mailing list for event details. The really cool stuff happened after the business portion of the meeting (as per usual). Angus brought in his new AR.Drone. 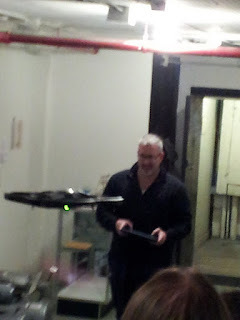 I uploaded some pics I snapped of him flying the little quad-rotor from his iPad. The camera feed on this thing is outrageous, it looks so cool on the tablet! I think it is just great that Makezine is keeping up with us. A day after our meeting they posted about the new version coming out next quarter. This is an eminently hackable device. There are lots of cool possibilities. Update: video of the drone at the space; thanks Jason!